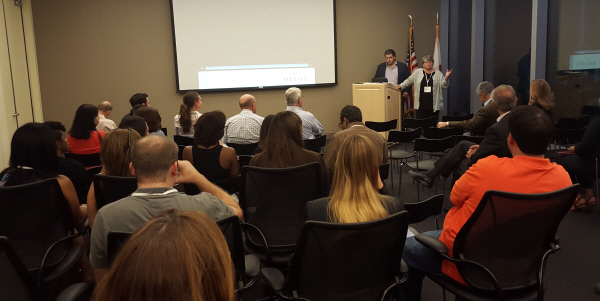 WELL building was the topic at last night’s U.S. Green Building Council – Miami Chapter program. Susan MacMurchy from Delos in New York and Jonathan Burgess from The Spinnaker Group led the discussion, which included an overview of the WELL Building Standard, and compared/contrasted it to the LEED Building Rating System. MacMurchy’s company, Delos, is the founder of the WELL Building Standard and the International WELL Building Institute. 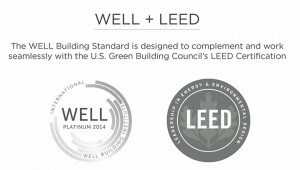 WELL Certification is administered by the GBCI, the same organization providing independent third party certification for LEED. The WELL Building Standard measures a building’s impact on human health by focussing on seven Concepts: Air, Water, Nourishment, Light, Fitness, Comfort and Mind. Silver, Gold and Platinum. Silver is achieved by meeting 100% of the WELL preconditions in all seven Concepts. Gold and Platinum levels can be attained by meeting additional “Optimization Features”. The WELL Building Standard is a performance based program with 80% requiring field verification. This contrasts to LEED’s “prescriptive” approach with approximately 20% field verification and the rest in the “specs”. While LEED for Building Operations + Maintenance does require post-completion re-certification, the other LEED certifications do not. All of the WELL Certification project types require a three-year recertification. The WELL Building Standard version 1.0 is currently applicable only commercial office buildings, including Core & Shell, Tenant Improvement and Whole Building New Construction. There are pilot programs for multifamily residential, education, retail and restaurant projects. Future certification programs will include sports & fitness centers, large transient buildings such as convention centers, airports & arenas, and health care facilities. We have broadened the scope beyond just environmental sustainability – by including the best concepts of green technology, we have developed an integrated solution that addresses a complete human sustainability. Susan MacMurchy led a team of architects, designers, researchers, graphics experts and writers in the creation of the original DELOS brand. 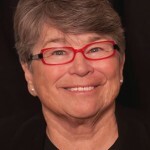 She contributed to the development of a system of passive therapies (now the WELL Building Standard) that enhance human sustainability and wellness in the built environment while not requiring behavior change to improve occupant health. Prior to her work with DELOS, Susan founded Big Blue Fish, a consulting firm whose strategic/creative marketing initiatives contributed to the success of Fortune 500 clients and a variety of sports- development organizations. 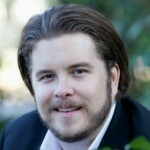 Jonathan Burgess is the Vice President of Sustainable Operations for he Spinnaker Group, a premier green-building consulting firm based in South Florida. Jonathan recently helped complete a WELL feasibility study for a Title-1 school in San Diego, CA. In addition, he is the co-Founder of a program focused on utilizing the WELL building standard to aid in trauma resolution and therapeutic building design. He is one of the first to be trained in the standard, and is touring the State of Florida to help kick-start local conversations about WELL in communities across the Sunshine State.